The gift of memories is a precious gift. What better way to tell a person's story than to let the fabric of their lives do the talking. Your loved one's story can be sewn with love, care, and expertise into a beautiful, one-of-a-kind quilt. 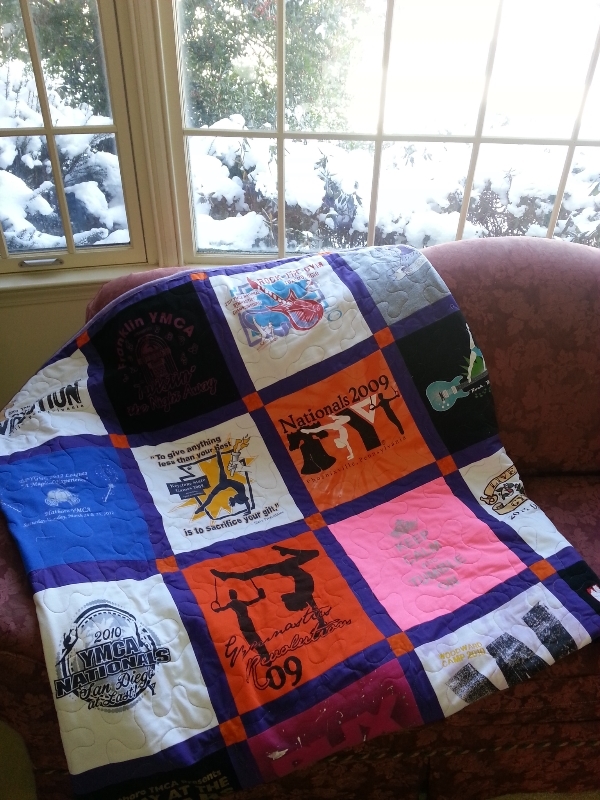 This past month many precious memories were sewn into several lap quilts, 2 full size quilts, and 2 king size quilts! Graduation quilts are in high demand. Currently I have 12 on my schedule, combined with the other 13 quilts on my schedule, my shop is busy each and every day preserving your dearest memories. 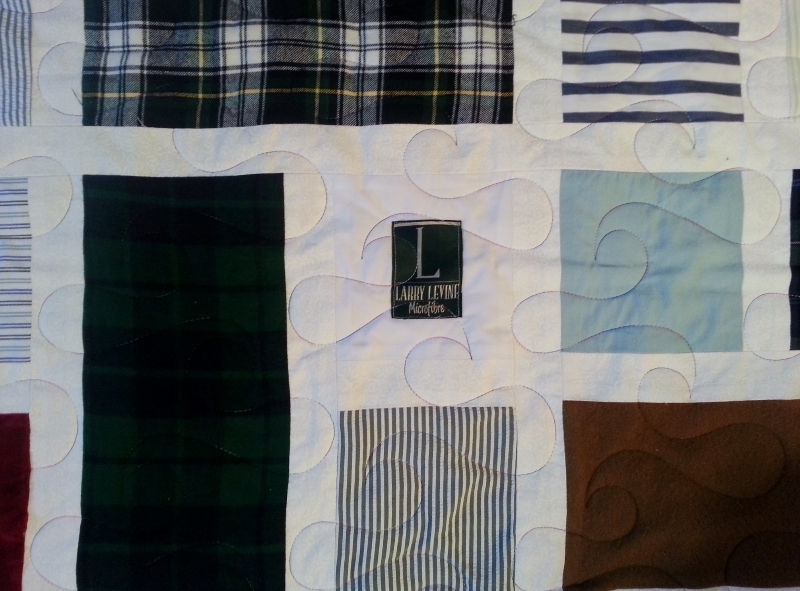 If you are interested in a Memory Quilt for any occasion, please contact me ASAP so I can add you to the list. Quilts are now taking 3-4 months. 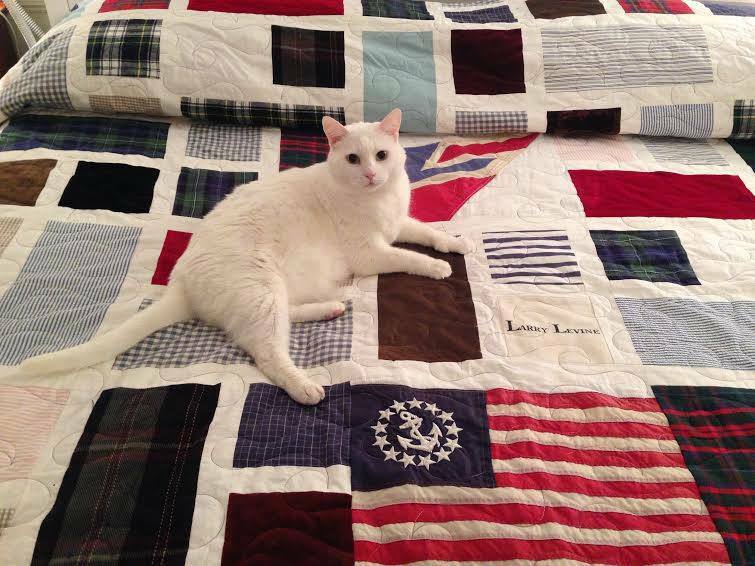 I hope all of you are staying warm, snuggled under a Memory Quilt, on these cold winter days. 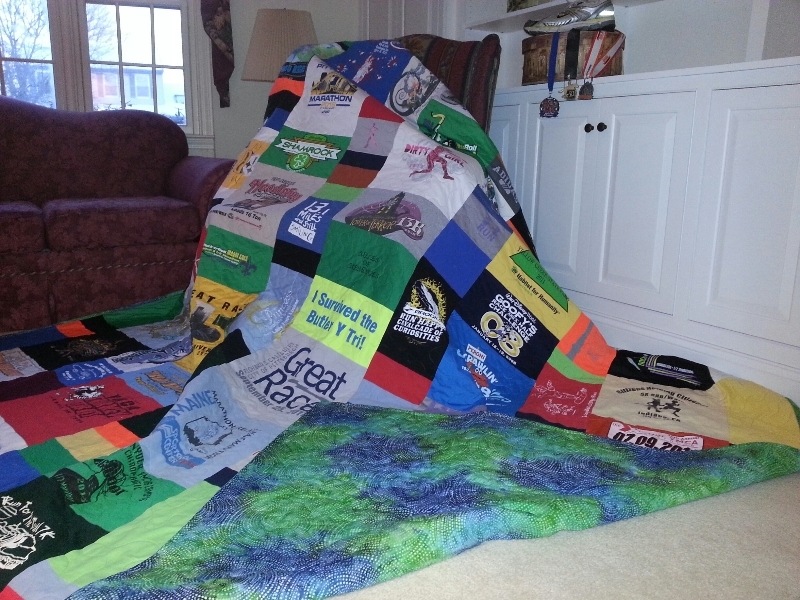 This Modern style, king size quilt was made with 60 running shirts from all over the United States. Full marathons, half marathons, triathlons, and 5ks galore. Many of the shirts were made of the high performance material that is popular today. It was backed with a gorgeous green and blue cotton batik fabric that I found in Lancaster, PA. It truly is reversible and tells a dedicated runner's story! Fabric really does tell a person's story. Below are quilts that tell different stories. The one below illustrates the love of gymnastics, and tumbling. 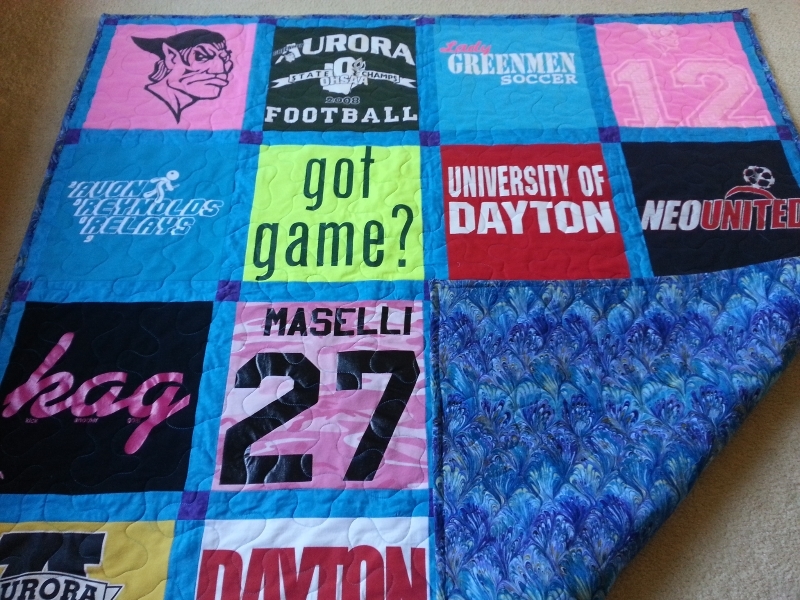 The quilt below it tells a soccer and collegiate story! Both quilts below chronicle stories of championship tournaments. 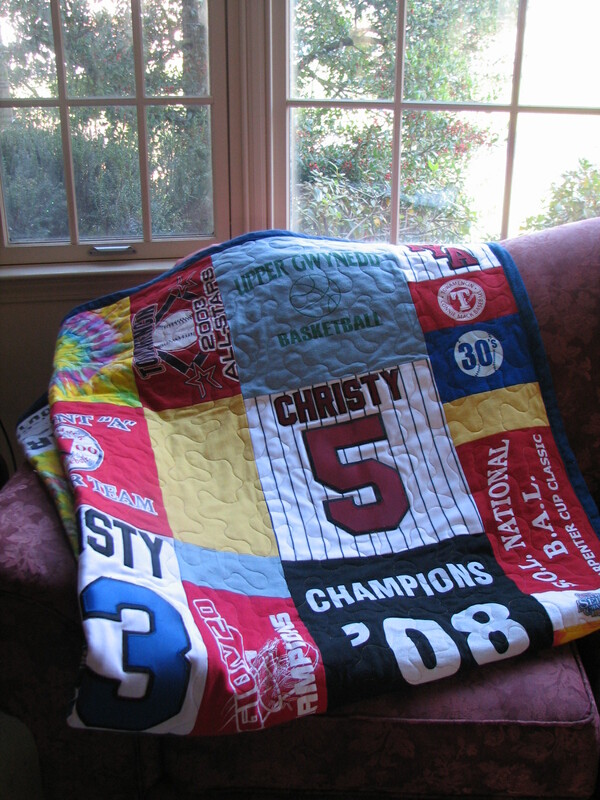 The quilt below portrays a baseball, all-star story. The quilt below it recounts a softball, all-star story. 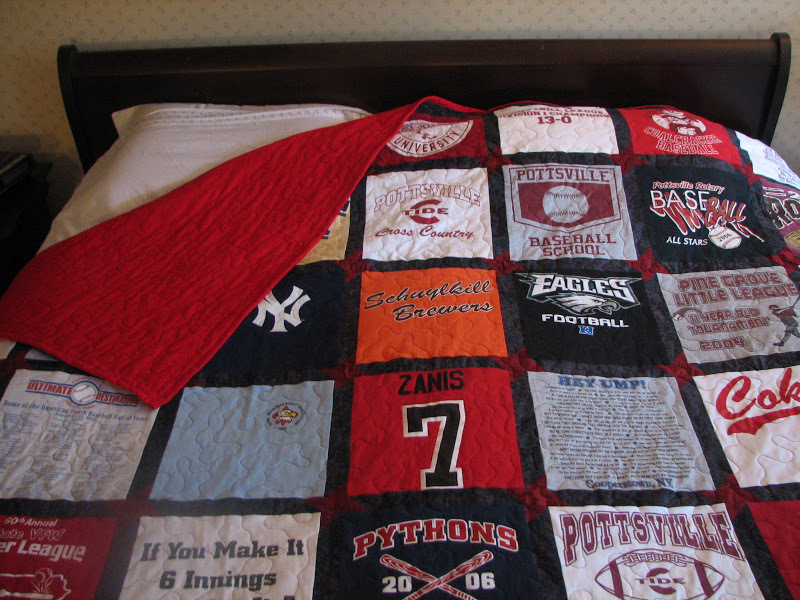 This quilt below tells a story of a youth spent in Pottsville, PA and the love of baseball! 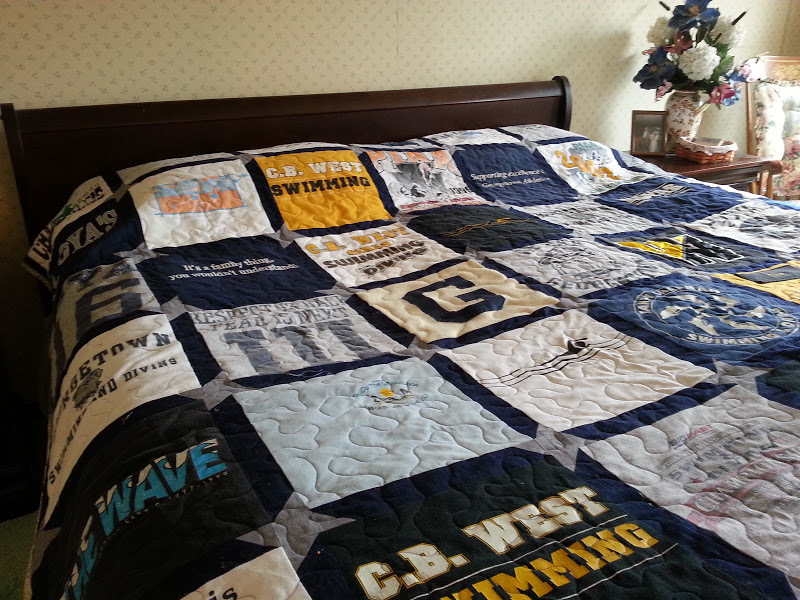 The quilt below it illustrates a swimming saga that begins at Fanny Chapman in Doylestown, PA and ends in Georgetown University as a Hoya! What story to you have waiting to be told through a Memory Quilt? 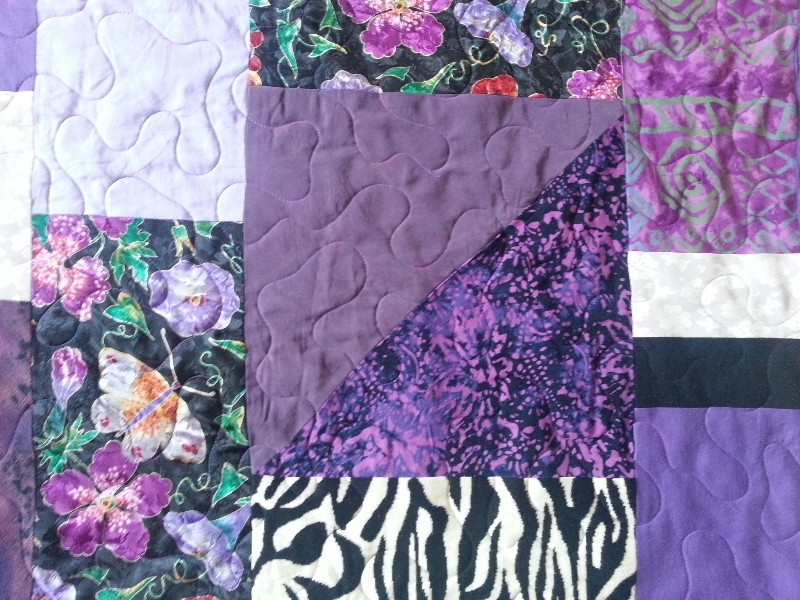 Another way I strive to make your quilt as special and unique as it possibly can be. The Wave Stitch is shown above, the Meander stitch is shown below on the left and the Swirl stitch is on the right below. If you are local, we schedule a meeting at my shop. At this meeting we discuss your quilt and you get to see and feel some of my handmade quilts. If you are outside the Philadelphia area, you simply send me the items listed above via the US Postal Service, UPS, or Federal Express. UPS is fast and does a great job tracking the package and notifying you once it has been delivered. This process is very reliable. My quilts have been mailed to 4 continents! Once I receive the package. I always email you and let you know that the package is safe. After this task is completed, your work ends and my work begins! You can sit back, relax, and enjoy the pictures that I send of your beautiful quilt. Federal Express has a wonderful opportunity for small businesses like mine. They are giving away a $25,000 grant for a worthy small business. I have applied for this grant, but they want people to vote for it via Facebook. I would appreciate your vote! Graduation quilts are now being ordered! My schedule is almost full. NOW is the time to order. Please remember that these quilts take a very long time to make AND turning people away is no fun!